Hydrangeas were not too long ago considered by many as “old time plants.” That is, plants found in grandma’s garden. The plant, however, is making a comeback as breeders have found ways to extend the bloom, reduce the overall size of the plant, and expand the color range of the flowers. This, combined with names like Incrediball, Cityline Mars, Let’s Dance Starlight, and Edgy Hearts, will have you wanting to take another look at hydrangeas and find a space for them in your garden. While hydrangeas are marketed as adapted for full sun to part shade, here in the south it is best to plant them in part shade. Specifically, they will perform their best when planted in morning sun and afternoon shade or in a dappled shade environment. They need moist, well-drained soils. It is common for their leaves to droop in summer during the heat of the day. During a drought they would benefit from a deep watering once a week to keep them hydrated. Remember, they put out most of their energy in the summer when they are blooming during the hottest months of the year. 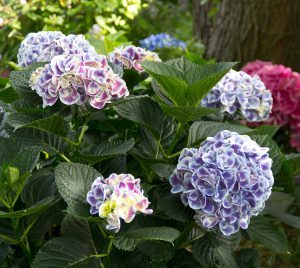 Hydrangeas have few pests, but are susceptible to both leaf spot diseases and powdery mildew. Many of the newer cultivars have been bred for resistance to powdery mildew. Implementing good pest management strategies such as watering at the root zone and not on the leaves, removing fallen leaf litter, followed by a 2-3 inch layer of mulch will also help to reduce those problems. Hydrangeas are also known for their tendency to change their flower color based on the amount of aluminum in the soil. Aluminum is generally more available in the soil when the pH is low and the soil is acidic. 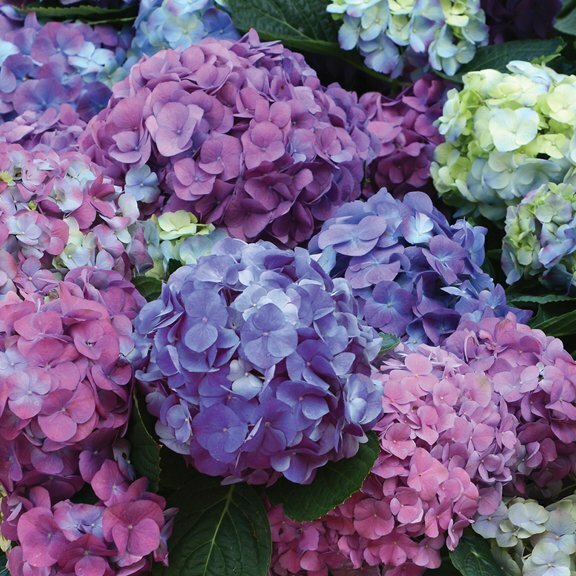 Hydrangeas with the tendency to turn blue are found in low pH soils with aluminum, while higher pH soils with low to no aluminum will be pink. This actually is only true with the large leaf hydrangeas – Hydrangea macrophyllas and Hydrangea serrata. I rescued a hydrangea from my husband’s great grandmother’s garden where it was blue. I planted it in my landscape where it was blue, purple, and pink all on the same plant. 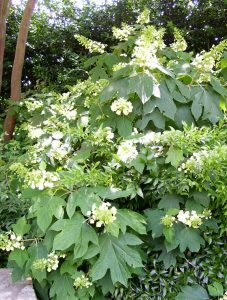 There are two hydrangea species that are native to North America: Hydrangea arborescens (smooth hydrangea) and Hydrangea quercifolia (oak leaf hydrangea). Hydrangea arborescens can tolerate more sun than other hydrangeas. Hydrangea querciforia has outstanding leaves that resemble our oak leaves. In the fall these leaves turn brilliant shades of burgundy to red. 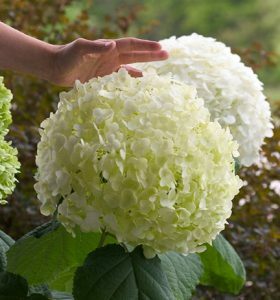 Both of these types of hydrangeas have enormous white flowers. All hydrangeas are deciduous. In the winter, branches appear naked with some persistent dried flowers. There is no clear-cut general rule to follow with regards to pruning hydrangeas. What you must know in order to prune them is whether or not they flower on new wood or old wood. If they bloom on new wood you can cut them back after they bloom or in the winter. This applies to Hydrangea arborescens, Hydrangea involucrate, and Hydrangea paniculata species. If they bloom on old wood, prune immediately after bloom and only about one-third of the plant. Pruning too much will guarantee you get no flowers at all. This applies to Hydrangea macrophylla and Hydrangea quercifolia. Just remember, you don’t have to prune in order for this shrub to flower, just to control the plant’s size. If you are fine with its size, it is one less task in the garden for you to do. Pay attention to the sizes of the new cultivars coming on the market. 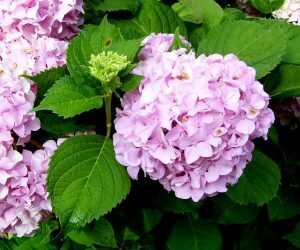 Some, like Hydrangea macrophylla ‘Paris Rapa’ only grow 1-3 feet tall and wide. Hydrangeas are not deer resistant. In fact, deer enjoy them very much. To prevent the total destruction of this plant, plant this shrub near the house and surround it with less desirable resistant plants. Those plants will create a barrier and make it harder for the deer to browse. 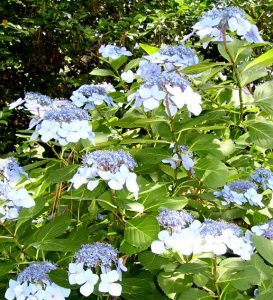 Download the North Carolina Cooperative Extension Durham County Hydrangea Handout with details on pruning an extensive list of hydrangeas. Michelle Wallace is a freelance writer.